A new Superfund Research Program (SRP) study showed that nitrous oxide (N2O), a groundwater contaminant commonly generated from agricultural runoff, inhibits bacterial degradation of certain chlorinated contaminants, including tetrachloroethene (PCE). 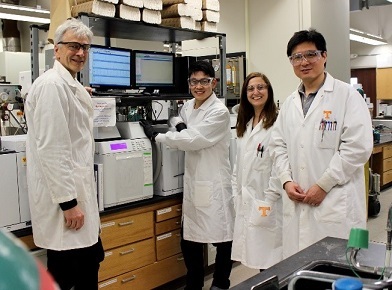 Led by Frank Loeffler, Ph.D., a Governor's Chair Professor at the University of Tennessee and Oak Ridge National Laboratory, the study may explain why bioremediation, or the use of bacteria to break down compounds, can stall at some hazardous waste sites. Bacteria have been used to turn contaminants like PCE and trichlororethene (TCE) into non-toxic ethene by removing chlorine atoms in a process known as reductive dechlorination. However, PCE and TCE are not always fully converted to ethene, and toxic intermediate chemicals such as cis-1,2-dichloroethene (cDCE) and vinyl chloride (VC) are produced. Loeffler and his team are exploring how biological and geochemical conditions at a site can affect reductive chlorination activity of the bacteria. Among these conditions, for this study, the researchers explored how N2O at concentrations often found in groundwater aquifers can impact this bioremediation process. N2O, best known as laughing gas and as a strong greenhouse gas, can also accumulate in groundwater. Runoff from nitrogen-based fertilizers is a major contributor to N2O generation in groundwater aquifers. Loeffler and his team explored the impact of N2O on the dechlorination of PCE, cDCE, and VC by bacteria used in bioremediation, specifically Dehalococcoides mccartyi (Dhc) and Geobacter lovleyi (Geo). The researchers found that low concentrations of N2O reduced dechlorination rates and resulted in incomplete dechlorination of the chlorinated compounds. The reductive dechlorination pathway is sped up by enzyme systems that require a set of helper molecules known as a corrinoid group. Based on their findings, the authors suggest that N2O interferes with the corrinoid group, which can affect how well bacteria degrade chlorinated pollutants. By looking at the rates of chemical changes during the process, they found that the final step of the dechlorination process is most susceptible to the presence of N2O. This step, which converts VC, a human carcinogen, to non-toxic ethene, is also crucial for achieving detoxification of PCE, TCE, and cDCE because these compounds are broken down to VC before being further degraded to ethene. N2O has received considerable attention as a strong greenhouse gas, but its impact on bacterial processes in groundwater is unclear. The study demonstrates that the presence of N2O in groundwater affects how well bacteria can detoxify chlorinated contaminants and may help to explain why cleanup at some hazardous waste sites is challenging. 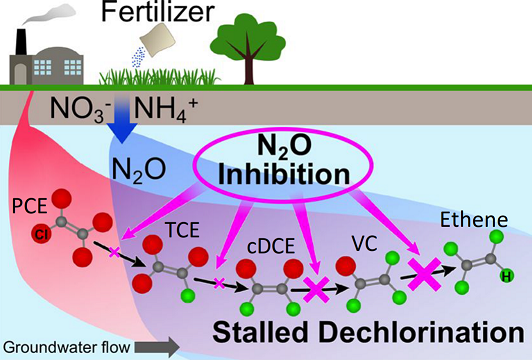 According to the authors, as fertilizer usage increases globally, so will N2O concentrations in groundwater, and a more detailed understanding of the impact of N2O on bacterial degradation of toxic pollutants is needed. Based on their findings, Loeffler suggests that groundwater monitoring during site assessment and cleanup also should include N2O measurements to identify the potential for inhibition and stalled dechlorination activity.